Is it time for a new roof? What type of roofing material is right for your home? Well…that really depends on your house -and what *you* want. The most important thing to remember is that all roof types have to be installed just as the manufacturer instructs because that is how they were designed to be installed. Otherwise, the roof can leak and it won’t last as long. Even a long-lasting metal roof will fail very quickly if it isn’t installed correctly. Various roofing materials offer different benefits. Some may be more affordable while others last the longest. Some may be more prone to damage while others aren’t. And some may need more repairs than others. If it’s time for you to replace the old roof, it’s a great time to look at alternative roof types. You don’t have to put the same type of shingles on the roof! Our Stevens Point roofing contractors would be glad to go over some of the different roofing systems available and the benefits associated with them. What you may not know about asphalt shingles is that they are actually a composite roofing material. You’ve probably heard about composite roofs but only associated the term with synthetic slate or faux cedar shake shingles. Composite just basically means that several materials are joined together to create the final product. Asphalt is made of organic materials like waste paper or wood fiber and combined with asphalt and limestone granules. 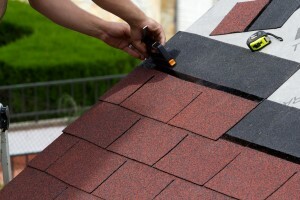 Asphalt shingles are a very economical solution for sloped roof replacements. There are some asphalt shingles with a fiberglass reinforced mat that are expected to last 15-30 years but the bonding of the material with urea-formaldehyde resin means that they are not very environmentally friendly. Metal roofing has become very popular in three different types: standing seam, corrugated metal, and metal shingles or tiles. Standing seam metal roofs are the most popular because they won’t leak if properly installed. They give you one smooth, sleek looking roof that routes rainwater and melting ice off very well. No matter what type of metal roof you choose, the installation has to be flawless so you have no problems with it now or later. The synthetic slate shingles, or roof tiles, look like real slate. They are available in all the real slate colors and are formed as a composite material. The material is lightweight and fully recyclable. Repair and installation will need to be done with special techniques, so make sure your roofer knows how to work with synthetic slate. Just like synthetic slate, you can install synthetic cedar shake roofs. The cedar shake shingles look very realistic. You can always go with real cedar shake if you prefer. But be ready for them to weather and develop problems much quicker than any other roof type. This is why so many people choose to go with the synthetic option. If you would like to learn more about Roofing Types in Stevens Point, WI or our other service areas, please call Oakwood Exteriors, LLC at 715-432-8202 or Schedule a Free Quote Now online. New Roof: Face Lift for a Whiting Home!